Your wedding ceremony is just the beginning of the festivities. The celebration continues at your reception. Your wedding reception may be the most important - and largest - party you will ever throw. And a great party deserves a great venue. 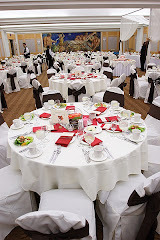 The number of guests.A large guest list requires a large venue, such as a reception hall or hotel ballroom. Some halls can accommodate up to 900 guests and more. If you have a small guest list, you will be able to have your reception in a more intimate setting, such as a museum, botanical garden or historic home. Do you want a formal hall with separate areas for drinks, dining and dancing? Perhaps your site would look beautiful by candlelight. Maybe you want something a little more rustic? Do you want to feel fresh air on your face? Whether you're looking for roomy and airy, or close and cozy, try to view the venues you're considering after the facility's staff sets up for a wedding or while a reception is in progress. That way, you'll be able to judge what the room looks like with decorations and people, and tell whether it's the right atmosphere for you. Do you see your reception surrounded by green trees? Or perhaps a view of the city's skyline? Maybe you want to be surrounded by colorful blooms or a country field. When you look at a reception venue, consider not only the interior but also the exterior. Look out the windows and make sure you're happy with what you see. Some reception sites can provide you with a number of services that may make your planning easier, including an on-site wedding coordinator, catering and wait staff, bakers, and valets. If a site does not provide these services the staff should be able to provide you with a list of recommended providers with whom they've worked before or with whom they have special pricing arrangements. Many brides say that finding a reception site is much like shopping for your dress - not only can you imagine it clearly when you close your eyes, but you'll know the right one when you see it. And with so many venues available throughout the St. Louis area, you can be sure to find one that fits! It's amazing to visit this site and reading the views of all colleagues about this article, while I am also zealous of getting familiarity. I've been surfing online more than 4 hours today, yet I never found any interesting article like yours. It is pretty worth enough for me. In my opinion, if all web owners and bloggers made good content as you did, the internet will be much more useful than ever before.